East West Qigong International (EWQI) has been serving Hawaii community since 2000. Our mission is to facilitate self-healing through qigong training on self-practicing and research into the principles of Qigong. EWQI’s Vision is that every community and work place in the US and worldwide can benefit from Qigong. 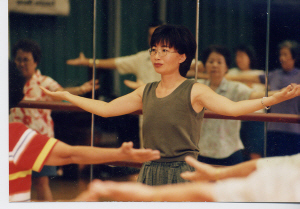 The vitality of public health will be increased by educating the public of the healing benefits of learning and practicing Qigong and through extensive research into the natural healing effects of Qigong. In the past six years, EWQI has conducted numerous free or low cost seminars, classes, and workshops at different conferences, workplaces, hospital clinics, retirement homs, and community centers. Thousands of people have benefited from attending our events. We continue to promote qigong training among all the communities within the state, in USA and in the whole world. See EWQI Goals. Qigong is an ancient Chinese system of self-healing and health maintenance, developed thousands of years ago in China. The practice of Qigong uses special methods of breathing, posture ajustment and mental concentration to balance and strengthen energy systems within the body. Qigong is used for self-improvement and self-healing. Benefits of Qigong cover a wide range of things and the first are, health benefits, health from physical, emotional, mental and spiritual point of view. The conventionally defined health problems such as heart disease, high blood pressure, kidney stones, ulcer, cancer, diabetes, back pain, sleep disorder, high anxiety, depression, etc., you name it, are all possible to be corrected with persistent and consistent Qigong practice. People normally notice changes in their overall lives after practicing on a regular basis for a while. Qigong also opens the door to spiritual development. It is a great tool of achieving overall well-being and integrating physical, emotional, mental, and spiritual health. There are many different styles of Qigong practice based on the principles of Buddhism, Taoism, Confucianism, Chinese Medicine and Chinese Martial Arts. See more articles on Qigong.